More than 100 lone children cross into Uganda each day fleeing conflict in South Sudan, walking for days with no food or family to sustain them, an aid agency said. World Vision said at least 9,000 children have made the journey since last July and it expects another thousand to join them by mid-year. “The majority of these children saw their parents being killed, while others lost touch with their families once fighting broke out. 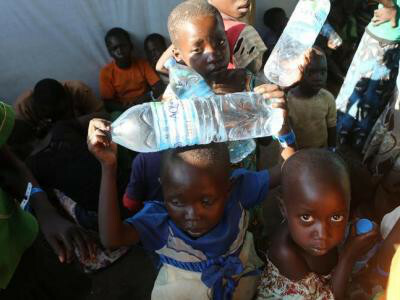 Some of them walk for more than a week to get to Uganda, with nothing to eat,” said Gilbert Kamanga, country director of World Vision in Uganda. “This is one of the worst forms of violence against children. It must stop. Peace needs to prevail in South Sudan,” he said in a statement. Uganda hosts about 898,000 refugees, with more than 2,000 people arriving daily, mostly women and children, according to the United Nations refugee agency UNHCR. Children make up 62% of the 1.8 million people displaced by fighting in South Sudan and more than 75,000 unaccompanied children have fled to Uganda, Kenya and Ethiopia, the UNHCR said. Two years after independence, South Sudan plunged into conflict in 2013 after rivalry between President Salva Kiir and his then-vice president, Riek Machar, exploded into violence. A 2015 peace deal was signed but the terms were never fully respected. Lingering suspicions between Machar and Kiir triggered a fresh bout of fighting in July 2016 and violence has since spread to large areas of the country. United Nations agencies increased their 2017 appeal for South Sudan’s refugees, saying they need at least $1.4 billion to help support those fleeing fighting.